Some of nature's creatures are really exotic and the Abyssinian ground hornbill is surely one of them. With an 8 inch beak and a wingspan of 6 feet, they are amazing birds covered in black feathers and sporting a colorful blue or red wattle depending on if they are male or female. They usually live in countries in northern Africa. But one of these exotic birds lives in the United States at the National Zoo. His name is Karl and he's about 27 years old. Trouble is, the lower part of Karl's beak had worn away. This isn't good news because ground hornbills walk up to 7 miles a day searching for food which they pinch in their beaks and then swallow. Karl's beak couldn't do that any more. The staff at the National Zoo knows a lot about birds and they care about the animals in their collection. 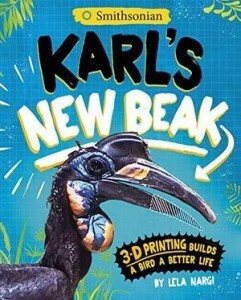 So, they went to work to figure out how they could make Karl a new beak. This is the true story of how the veterinarian, James Steeil, the bones of a ground hornbill from 1930, the zoo's exhibit specialist, Bobby McClusker and the wonder of 3D printing came together to give Karl a new lease on life. Photos and drawings illustrate the steps along the way. For readers who care about animals and who are fascinated by what computers and 3D printers can create in the hands of the right professionals, this book will be an exciting adventure.